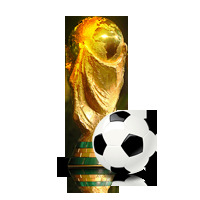 No matter which country you cheer for, the 2014 FIFA World Cup offers fans and bettors alike many reasons to shout and get excited. 32 teams will take to the pitch in the Opening Group stage, with only half of those advancing to the second stage. So which teams will make some noise and which teams should just feel lucky to be invited? We take a look at the five regions and give you the rundown on who is worth backing with your betting dollar. Unlike the lead up to the 2010 World Cup in South Africa, the African teams are not considered threats to do any damage. Cote d’Ivoire and Algeria are the two teams riding momentum: CIV for their part had 5 wins and 3 draws in the qualifying stage, boasting an impressive goal differential of +12, while Algeria has risen to be considered a bona-fide threat in Group H, which is considered relatively weak. Of the African nations, all eyes will be on Cote D’Ivoire’s Didier Drogba, the now 35 year old legend who boasts the most goals in Cote d’Ivoire history. Ghana has fallen off a bit as of late, although they are eager to overturn the injustice of 2010’s infamous handball by Uruguay’s Luis Suarez. Despite boasting some high level talent and lots of money, Asia has long been considered the forgotten child of world futbol. The only team considered a threat to advance is the “Samurai Blue” of Japan. The first team to qualify for the 2014 World Cup, Japan cruised through the qualification round with a goal differential of +22. Led by their Italian trainer Alberto Zacceroni, the former head of Juventus and Milan, Japan has seen their attacking prowess increase in the past seasons thanks to star players such as Keisuke Honda of AC Milan and Shinji Kagawa of Manchester United. Australia and South Korea are plucky opponents but have never proven to be a world threat, while Iran is in simply due to the numbers game. 5 of the only 8 nations to win the FIFA World Cup have been from Europe, and of those 5, Spain, Italy and Germany are considered real threats to take home the title this year. So what makes Europe so good? European squads boast a blend of size, skill and financial backing that you just don’t see anywhere else. 2010’s winners, Spain, once again are dominating all phases of the ball, while Germany is looking to make another trip to the finals. Add in a stout English squad eager to show it belongs with the world’s top teams and an Italian squad that boasts a magician in Pirlo and the most dangerous player in the world in Mario Baloteli, and simply put, Europe is stacked. Since hiring Jurgen Klinsmenn, “Los Gringos” have been near unstoppable, thanks to a renewed focus on tactics (and favorable weather conditions). In 2010 the US Squad made it to the Round of 16, and there’s no reason to think this year they won’t do even better. It all starts up front with underrated players such as their leader Landon Donovan and Clint Dempsey. With Klinsmenn finally getting the most out of promising Jozy Altidore and up-and-coming Eddie Johnson, the US is looking to do some damage in Brazil. Rounding out the area, once-proud Mexico has fallen off the planet, perhaps a victim of their own arrogance and poor coaching, while Honduras and Costa Rica are solid squads, but may be victims of poor group drawing. In the South American area, host nation Brazil is a match-up nightmare, while Argentina boasts perhaps the most ferocious attack in the world. Those two nations are usually considered the bona fide threats on the continent, but the rest of the group can easily beat anyone in the world: Chile and Ecuador are playing inspired ball as of late, so good in fact that one of the favorites to win it all – Uruguay – barely qualified for the World Cup. However the big story in South American futbol is the re-emergence of Columbia as a true powerhouse. Not since the days of Carlos ‘El Pibe’ Valderrama have Los Cafeteros played so well, but the recent loss of All-Star Radamel Falcao may prove too much to overcome.